Okay, so having been on the web for some time with this site can draw some interesting attention. We'll often get company X or Y who's starting their crowdfunding to get their project off the ground and want me to be able to help get the word out. I get a little picky as it has to meld with the site's directive (I'm not sharing a new USB hub for the Macbook or whatever for iOS...). Often they just want the word spread about - but I have a hard time doing that without either being a) really interested in it myself or b) a unit to test out. 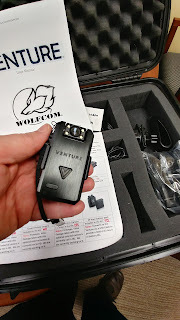 Well, luckily Wolfcom has decided to send on their Venture body cam on to me to test out. 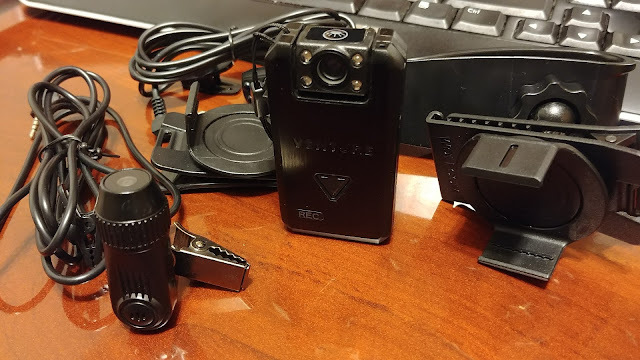 It's a body cam, like an action cam you wear, that has an Android app so you can control the camera. That sounds like fun. At first, I thought, it'll be neat. When it did come it was a MASSIVE shipping briefcase. Sure, they included several of the accessories and that made sense, but still, makes for a huge shipping headache. Anyways, time to play. 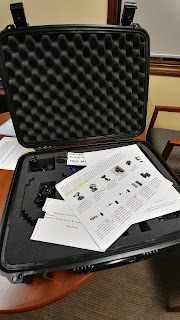 So, walking around with the briefcase feels a little goofy for such a tiny thing, but it's just the reviewer's case. You'll have something much more practical to cart it around with. The first thing that I've noticed when using this is that immediately everybody will ask you "is that a GoPro? ", and you'll need to be prepared to answer that question. What is the differentiator here? To be honest, I'm hard-pressed to find a real answer. Okay, let's get on with the review. There are some nifty things about this, but there's a lot that aren't ... hopefully, this will help you determine if $165USD at the early bird perk level is enough for you. Okay, let's get right to the first major complaint I have with this whole ordeal. There are lots to complain about here but the biggest, most frustrating fact is that there's no way to really see what you're doing with this camera. You turn it on. And it records. I guess this is how things work with action cameras... I'm just not used to it. Sure, the OTR (one-touch record) switch makes it simple. I'll get to the AVD feature in a second. But you can't tell what it's recording. Trying out the sunvisor clip in my car I did several videos of it getting my dash and hood. You can't see it until you get it to a computer (sure there's an app, but more on that later). I tried adjusting it a few times and lining up to what I thought would be a view in front of the car, but never got it right. I clipped it to my vest when I went biking, and sure I'm slightly hunched forward, but even still, it's a disconcerting downward angle. No matter how many times I've played around with it, I just can't seem to get the angle just right. That was really annoying. If I can't get that right, it's of no use to me any further. Maybe it'll take time to keep adjusting it. I dunno. So, to help in this effort there's supposed to be an app you can connect your camera to. Now it uses WiFi Direct, which is a bit of a tiring way to connect (you have to disconnect from the house WiFi to connect to the device etc...) however in the review unit I have it's not ready yet. So there's hope that down the road users will overcome this feature. Now to use it you have the OTR. The idea being that you just switch it from OFF to ON and it starts recording. It'll buzz to indicate that it's recording and the red REC on front will light up. If you flick it to OFF, nothing will happen, they have this AVD (anti-video deactivation) feature where if it's just accidentally switched to off it doesn't stop recording. So to actually shut it off you have to flick it to OFF, then back to ON then back to OFF. It'll buzz to indicate that it's now off. Sort of a "show me you really meant to turn it off". Now it could be accidentally hit to OFF in the activity you're doing, then hit 5 minutes later to ON and then 5 minutes after accidentally hit to OFF then stop. It's a little discombobulating to deal with actually. Like if you started and find it was in the OFF spot but still recording, so you have to do the down/up, and is it off... or is it recording. I had so many little 'blips' of recordings... shots of the ceiling or walking with it around the house. It'll take a lot to get used to the order of things. To make things a little more complicated, the V on the front is a camera button to take stills. 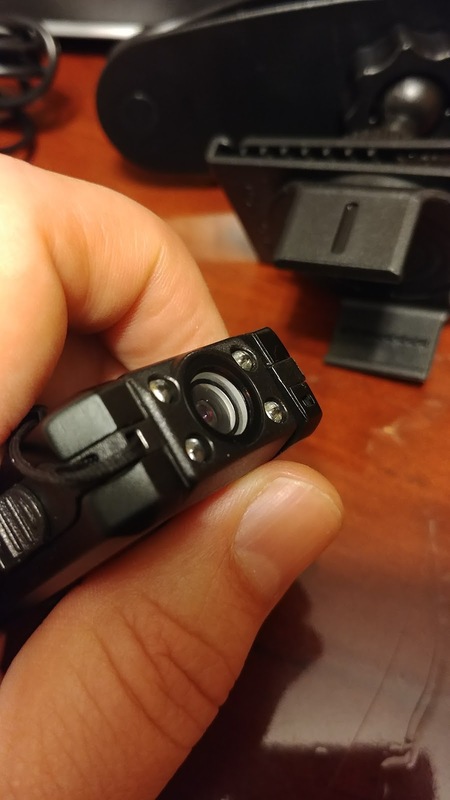 There's also a button on the top of the lens to turn on some LEDs for lights. Oh, right, the lens swivels too. 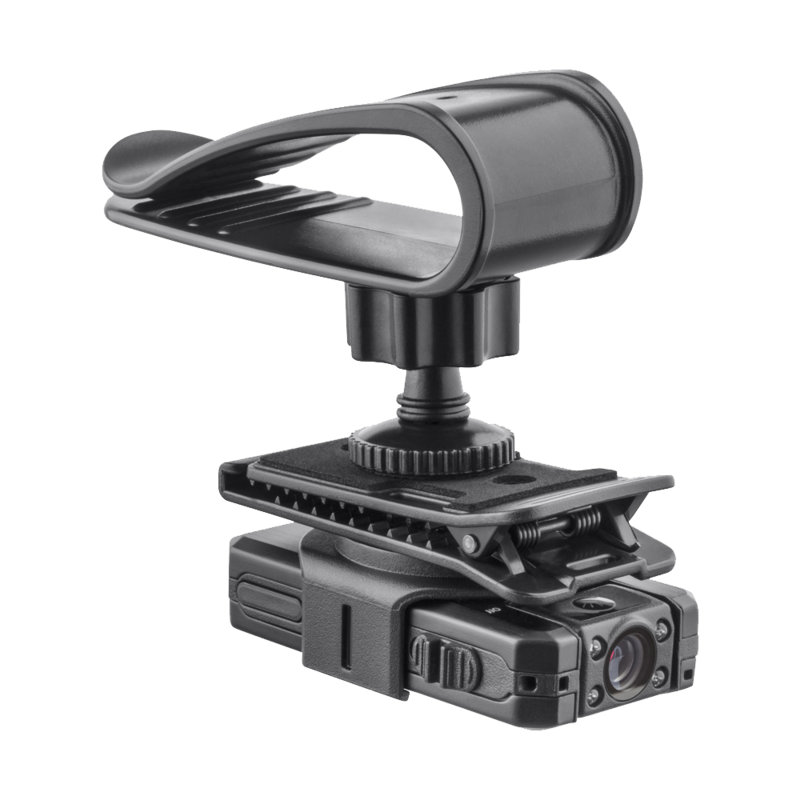 So you can adjust where the clip situates the is held (is it on a sunvisor, on a shoulder mount, etc...). Trippy thing is you have to then watch to see the video later to see if it was upside down or not. The next bit that's annoying about it is that it uses miniUSB port to connect and charge. But you can't use any cord, they warn you not to. I tried my other cables against warning and they just don't work. You have to use the cord they give you. Hopefully, that gets adjusted for the commercial models. To use it you have to plug it into your computer and then switch it on for the computer to recognize. 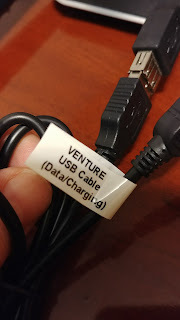 The over simplification of the device has now given it a bit of real 90's USB connection feel. A little archaic. Once connected it acts just like a USB drive. Of the 32GB space in there, it's got about 25 usable. In terms of how much time that is (because I can't see how to change resolution aside from using an external camera) I figure it's about 5.5 hours of recording. So this is one way that it does have some differentiation from the GoPro realm. It has accessories. It came with a few in my briefcase. There are more as well, like a 'pin hole camera' for secret videos and some headsets and other clip accessories so that it can be put just about anywhere. Again, the main problem of "how do I know what it's going to see" is a pain. Let alone that I had to flip the video as how I mounted it, it was sideways. As you can see from above the quality is pretty bad. It says it's supposed to be 720 but it only came out 480 on Youtube and looks like video from an old camcorder. Luckily it has a wider viewing angle so more of the scene is seen. I didn't try out the night vision ... but I'm assuming it'd be about the same, just at night. Th neat thing they have is this 're-connect' feature. If the cord dangling around connecting the main unit to the external camera becomes detached (I can see it getting pulled out accidentally) the video will switch from the external to the main camera lens so the video isn't interrupted. There also is the external battery pack, which nets you an extra 21hours of recording (but remember you'll only get about 5.5hrs of recording time unless they have external storage options to come). There's the sun-visor clip in there too. Again, be wary of where you point it to ensure you get what you want to see. All these accessories are neat, but you have to find the specific 'niche' for which you want to use them. Otherwise, it ends up being a mesh of cables and clips and stuff for you to try to organize and sort around. I hate messiness. Overall, the biggest downside to this whole ideal is the lack of the app. It really holds everything back. Without it you can't really tell before hand if it's lined up properly. Being able to edit videos, upload to youtube or FB live etc... it's all going to be icing on the cake. At the end of the day, I can really only see this for specific clientele use. I'm not sure it's got enough in itself to compete against the GoPro users. The user base is so niche ... I'm not sure it's going to be for the everyday user. Which is fine. It's good to have a targeted user, but resonating with them will be hard until it overcomes some of these issues. If, after you've looked at my use case issues and still think it's something for you, then it's a good shot. 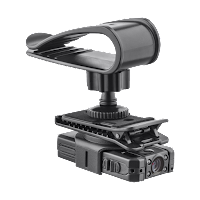 For $300USD on the early bird, you pick up many of the initial accessories. That's very much cheaper than a GoPro, and it is lower profile. Just have to wait until early 2018 for shipment.